MobileOps Inc. recently announced a major upgrade to its robust operations platform known as Form Builder. With Form Builder, customers can easily create unique form-based processes all within MobileOps. The company said that Form Builder boosts efficiency, team communication and employee collaboration. Form Builder was designed with ease-of-use in mind, said MobileOps. A user-friendly drag-and-drop interface enables any manager to dive in and start building forms right away. Form Builder users can use its simple text and date inputs to vessel-pickers and document attachments. Furthermore, customers can set up rules that show or hide other fields based on certain values—or even send notifications to specific people based on field values, which help customers eliminate confusion and paperwork. 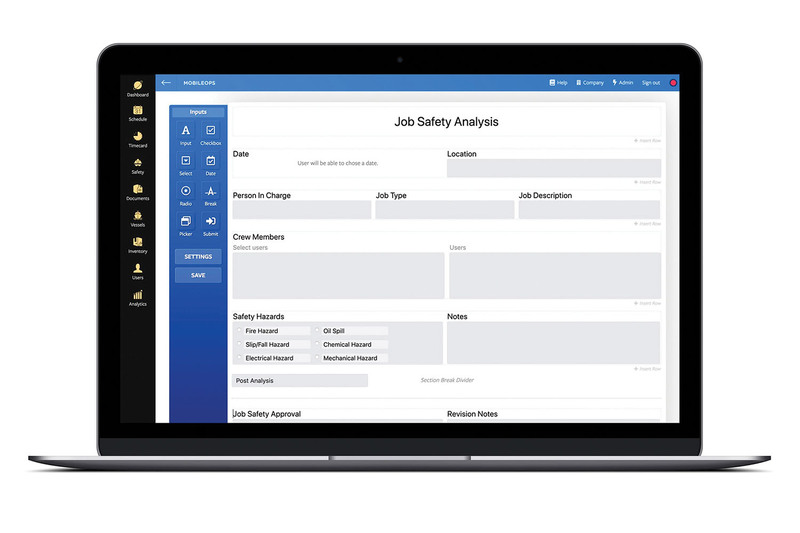 MobileOps is a cloud-based operations management software solution that includes vessel management, safety and training, jobs and dispatch, inventory/POs, invoices, timecards and analytics. Additionally, MobileOps has an offline-capable app called Voyager. The Voyager app allows data to be input, stored, and then synced with the MobileOps platform once a connection is present, allowing for seamless and efficient communications with shoreside personnel. MobileOps Web can be utilized on computers, smartphones and tablets with Voyager being available on computers and tablets.